UP's Ives rock train, the RIVUP, passes by St. Francis on its journey south on the Kenosha Subdivision. Crew went on duty at Bain around noon, headed north on the Milwaukee Subdivision with these 30 empty cars, turned the entire train on the wye here, and is now headed south to the quarry at Ives. Upon arrival at Ives, they'll spot these empties, pick up a waiting train of 30 loads, return here, wye the train, head south on the Milwaukee Subdivision to Upton, spot loads, pick up empties, and return to Bain. A recrew may be necessary. This is a new operating scheme for this train. In past seasons, the train would proceed from Bain to Ives via the Farm industrial track (between Bain and Kenosha); this season the trains are running via St. Francis instead of Kenosha. 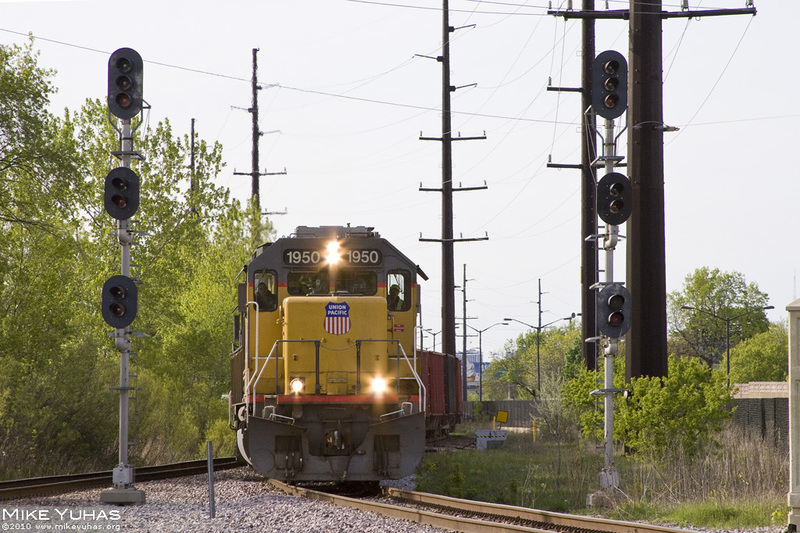 Interference from Metra trains is thus avoided. The 2010 rock season began on April 26.